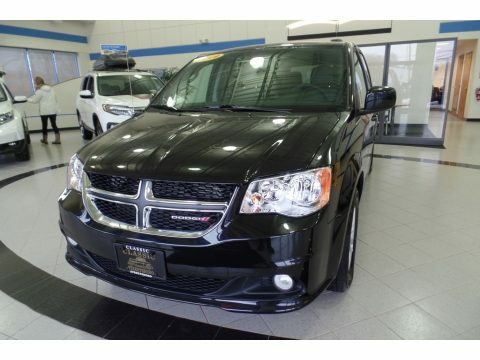 Our 2019 Dodge Grand Caravan SXT in black onyx pearl will be a hit with the entire family! Powered by a proven 3.6 Liter V6 that offers 283hp while connected to a 6 Speed Automatic transmission for smooths shifts. This Front Wheel Drive Caravan supplies ample power when you need it while also yielding near 25mpg on the highway. Put your best face forward with our SXT that's family-friendly and stylish with its chrome trim, fog lights, roof rails, power sliding rear doors, and a power lift-gate. Upon entering our SXT, you'll be impressed with the smart design that features remote engine start, keyless entry, tri-zone climate control, leather seats, a black leather-wrapped steering wheel with audio controls, full power accessories and 2nd/3rd-row stow 'n go seats. The entire family will enjoy the Uconnect touchscreen audio system with voice command, CD, available satellite radio, auxiliary audio jack and Bluetooth. Our Dodge Grand Caravan enjoys a superior reputation for safety so you can breathe easy behind the wheel. It's equipped with a rearview camera, stability control, anti-lock disc brakes, active front head restraints, and airbags. Everything you're looking for to help you take control of your daily routine, our Grand Caravan is a get-it-done machine that's all set to give you miles of smiles! Print this page and call us Now... We Know You Will Enjoy Your Test Drive Towards Ownership! Make the Classic Choice, at Classic Honda Streetsboro Ohio, for your next pre-owned vehicle purchase. Any questions please call 330-422-7000 and ask to speak with one of our professional and courteous sales people. Feel free to reach out to me (Used Car Manager T.J. Ketchem) directly 440-536-1898 call, text, or email at (tketchem@driveclassic.com).